June 2nd! Come Learn About our New Trail in Andes! | Andes Works! June 2nd! Come Learn About our New Trail in Andes! Andes will soon get its own Rail Trail! The Andes Branch of the Delaware and Northern was abandoned in 1925, but a portion of it will be re-adopted in 2012. Volunteers from Andes Works!, the Catskill Mountain Club and the Town of Andes are teaming up, along with the generous permission of the many landowners along the old Delaware and Northern railbed, to create an approximately 2.5 mile walking trail. The trail is planned to go along the flat railbed for a mile and then head uphill to travel for about another mile and a half, rejoining the railbed to end above the Bullet Hole Creek. The first mile of the trail offers wonderful views of the Tremperskill stream and Ballantine Park as well as fields and mountains across the valley. When completed, the trail will provide an easy 2 mile (round trip) walk right from town. Those who wish to tackle a more strenuous walk can continue on for a 5 mile round trip excursion through field and woodland. The Andes Rail Trail project was chosen as one of three New York State projects to receive assistance from Parks and Trails NY as part of the Healthy Trails, Healthy People program. On June 2nd, National Trails Day, we will introduce the trail to the town and have a little celebration for its coming. 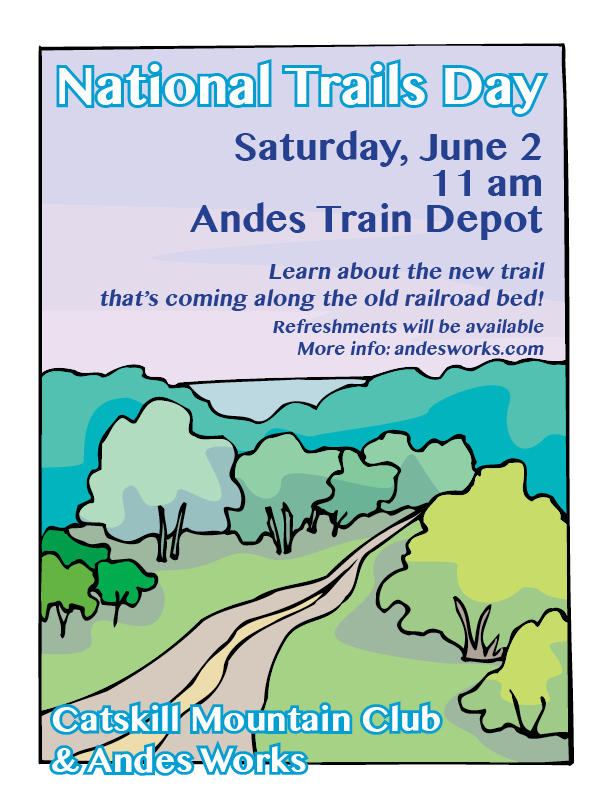 Please join us at 11:00 at the old Train Depot where we talk more about the project, go for a walk on the trail, look at displays from the Andes Society for History and Culture about its history and celebrate a little of Andes past and future. Refreshments will be available. Images from the Trails Day trail introduction…………..
5 Responses to June 2nd! Come Learn About our New Trail in Andes! Pingback: A New Trail in Andes! | Andes Works! This is a wonderful addition to our town! I plan on bringing some fresh healthy sandwiches & snacks from Hogans for sale at the end of the hike ..& look forward to participating! Pingback: Getting the New Trail Ready in Andes | Andes Works!